Much of Snake Pass is reminiscent of 3D platformers of old. David Wise’s score features joyous tunes similar to those you would have heard in the games he worked on during his time at Rare; the levels are colorful and full of glowing items to collect; and the main character is a wide-eyed expressive animal. All of that is what you’d expect from a game like Snake Pass but it is the unique movement mechanic and its integration into the puzzle aspect of Sumo Digital’s game that makes it stand out and feel much more like a modern day platformer. The traversal in Snake Pass not only asks you to move like a snake – including slithering side to side to keep up speed and momentum – but also requires you to think like a snake. Noodle (the smiling snake you control) moves just as a real snake would. His long body acts as one big muscle that allows him to lift his head and pull himself over obstacles. By controlling Noodle’s movement and the positioning of his head, you can pull him over ledges, up slopes, and around structures. 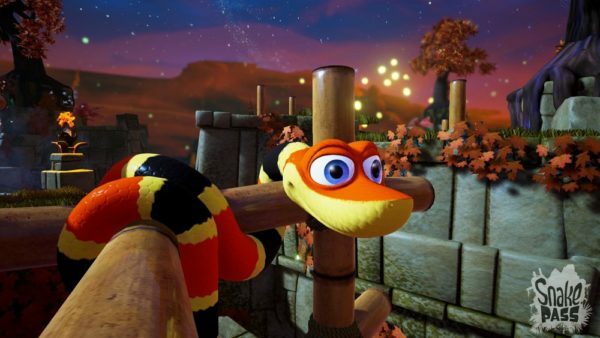 Having to think like a snake is what Snake Pass is built around. Every level requires you to collect three colored stones that act as keys to open up a portal. With the help of your slightly disobedient hummingbird friend, you explore the area searching for glowing wisps, coins, and the vital stones. The perfectly sized levels are never flat, but rather force you to climb bamboo structures to reach the next area. These structures can be complex and require a fair deal of studying before you make your ascent. By weaving Noodle’s body through the tight spaces and wrapping him around the poles, he is able to force his way up using the whole length of his body. You can even tighten his grip with a press of a button, allowing you to add more force to forward or upwards movement. Controlling Noodle often reminds me of the feeling of controlling the bike in the Trials games. You always have full control of the movement of Noodle, just as you do the bike, but the sensitivity of that movement means you will often lose control. Sometimes you will slither seamlessly up a rock face; another time you will struggle your way to the top, only to lose control at the last second and fall to your death in the spike pits below. Going at top speed over the moving obstacles and hoping you reach the other side is just as viable an option as holding on tight and moving an inch at a time. Traversing the levels is also the puzzle aspect of Snake Pass. You will be faced by larger structures as you get to the later levels – the difficulty spikes quite sharply after the first world. You will have to plan how to get across ravines or onto small platforms by movement only. Each small section will have a best way to go and trial and error is often the best way to work out which path that is. 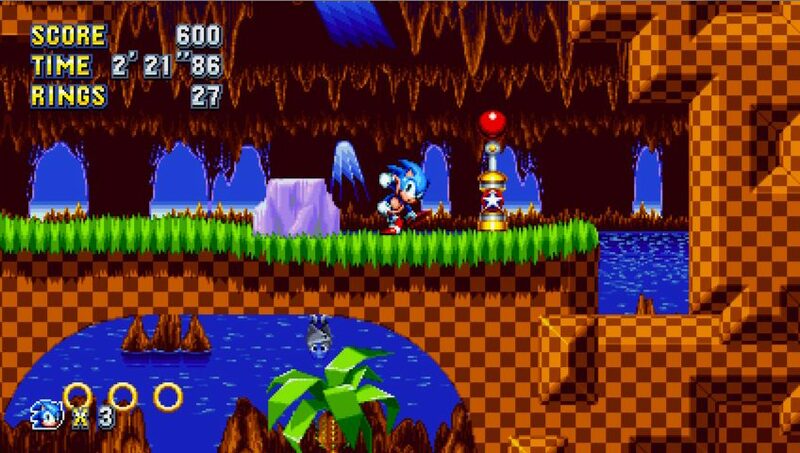 Wisps and coins are also placed in difficult to reach locations that force you to cling onto a small piece of bamboo above an abyss. Working out how to find all the collectibles and climb the structures can be challenging but it is by far the best part of Snake Pass. Learning what Noodle can and cannot do, and using his strengths in each level, is fun and rewarding throughout, if sometimes a little frustrating. The unruly camera can often make that trickier than it should be, however. It will frequently zoom in closely for an unknown reason or get stuck behind a wall as you attempt to climb. The best thing to do is to choose where to place the camera and climb a section without changing it. In the later worlds there are also environmental puzzles that make collecting the stones more difficult. They are all simple switch and platform puzzles that require you to find a switch, activate it, and make your way up the newly climbable piece of the level. Working out exactly what to do can be frustrating but these puzzles ensure that the later levels require more thought than the earlier ones. While they are wonderfully designed and beautiful, there is very little variety across those 15 levels. Each one is a small set of islands floating in the sky, with some areas covered with platforms that have bamboo structures on the side of them. The climbable structures are all of similar design, and the surroundings are always moss covered ruins. Each world introduces a new environmental trap, whether that be water, lava, or wind but they add very little to the format of the levels. 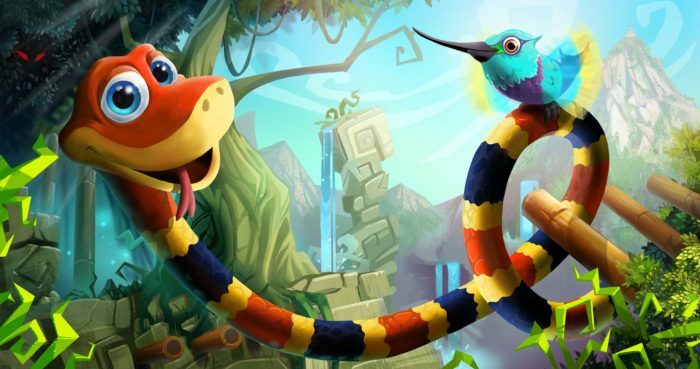 Thankfully, though, Snake Pass has quite a lot of replay value. 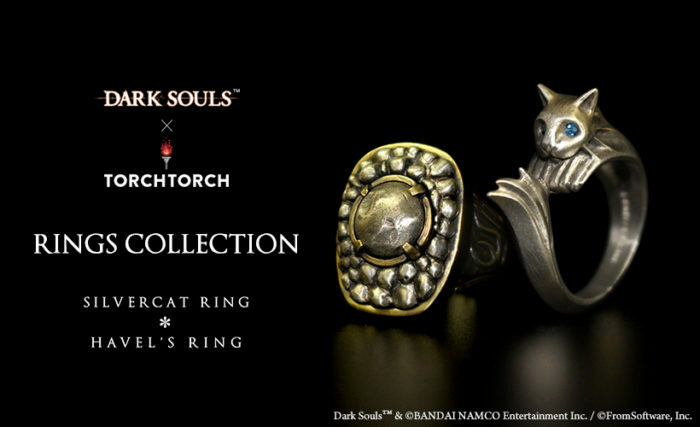 Once you’ve activated the portals in all the levels, you are granted freedom to explore each one again, finding the remaining collectibles along the way. There is also a time trial mode that tasks you with collecting all the key stones in a set time. Once you have done so, you will be able to compare your time with others’ via the leaderboards and attempt to beat the records set by your friends. With the range of difficulty in Snake Pass, I can see people attempting speed runs for quite some time. 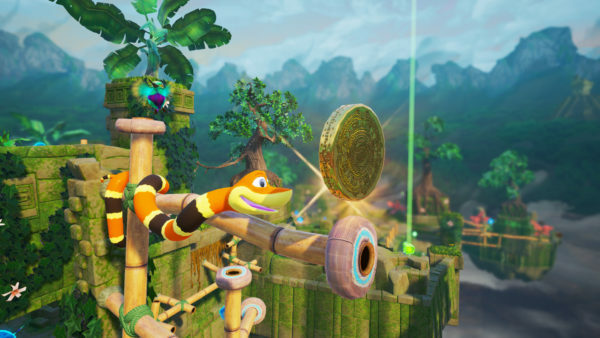 While Snake Pass looks and sounds like a 3D platformer of old, the ‘think like a snake’ idea that the gameplay is built around makes it a game that will influence platformers of the future. The puzzle is the movement, and since that movement is so fun and engaging, it makes for enjoyable experience, even if the unreliable camera makes it more frustrating than it should be. Fun, challenging, and rewarding traversal mechanic. Heaps of collectibles to find. Visuals and score are reminiscent of classic 3D platformers. Lack of variety over the 15 levels.